Mixed gardens. Excellent for cutting. Fairly easy and long lived. Cut stems to ground after flowering. Division needed only every 5 to 6 years. Painted daisies are among the most colorful and attractive of daisies. They are also one of the hardiest and plants are very early to appear in the spring. 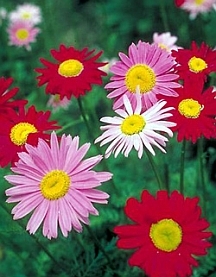 Painted daisies bloom in late spring and early summer in shades of pink, white, and red on 2 to 3 foot stems. They are excellent for bouquets The ferny foliage is attractive all season long, making them a nice addition to the mixed border or cutting garden. Painted daisies like full to part sun and are widely tolerant of soil type, though plants will develop best in a fairly fertile soil. Some browning of the foliage may occur if the plants are allowed to become very dry. Division will usually be required about every third year. This can be done either in early spring or fall. Space new plants about 1 foot apart.